Floyd Mayweather versus Rihanna: Rihanna Wins! - 2NGAW! Floyd Mayweather versus Rihanna: Rihanna Wins! 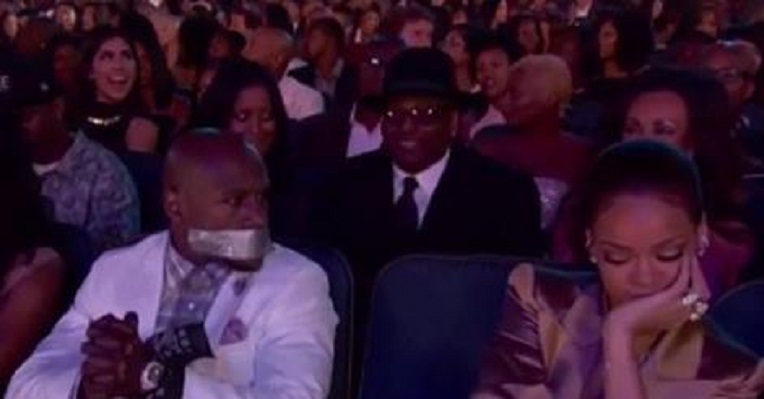 In a hilarious moment that has since gone viral across the web, undefeated boxing champ Floyd Mayweather, Jr. has been defeated – not by another great boxer in the ring but by a chic woman at the 2015 BET Awards (by the Black Entertainment Television network) held at the Microsoft Theatre in Los Angeles, California on June 29, 2015. Earlier, the singer could be seen carrying duct tape she used as a bracelet, with a long piece carefully cut from the roll but no one expected that she would use that piece over the mouth of the boxing champ! This rather unusual defeat has gained the approval of many netizens – and photos or videos of the moment quickly went viral.